Become a GrowthWheel Certified Educator and bring the visual toolbox and online platform for action learning into your classroom. GrowthWheel is a visual way of looking at areas of business that entrepreneurship educators already know about, and which entrepreneurs and business owners are already working on. 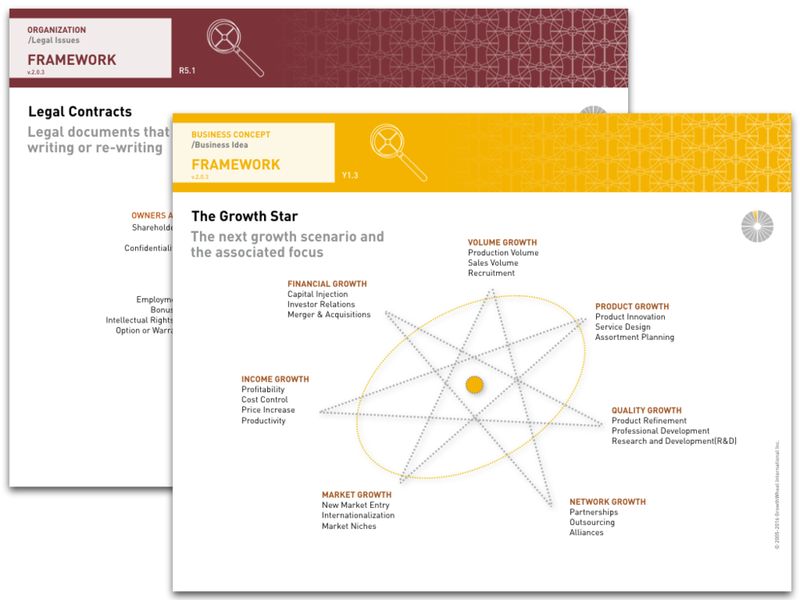 The GrowthWheel Framework breaks down the four challenges into 20 Focus Areas. For each of the Focus Areas there is a package of visual materials to be used for working on start-ups and business cases in the classroom — or outside. The GrowthWheel Toolbox contain all that is needed for a course of 10-20 sessions/weeks. 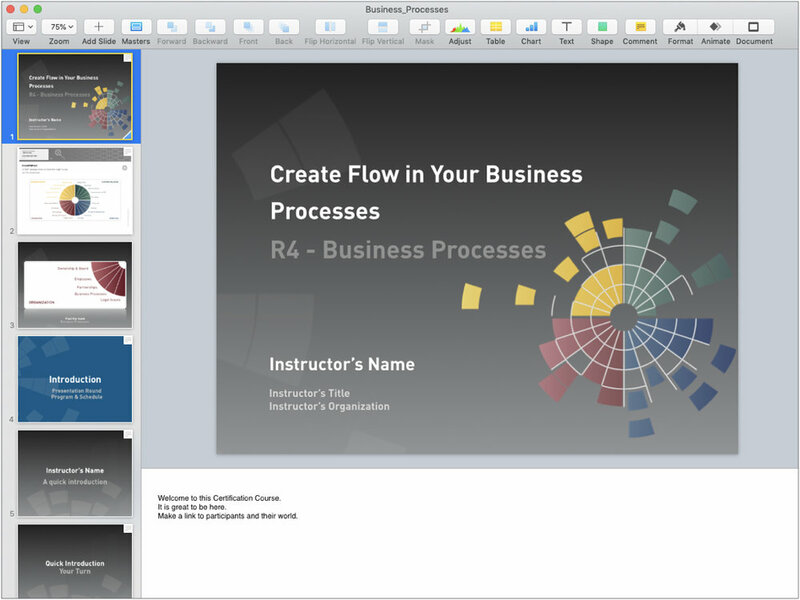 Instructors can build a curriculum entirely based on GrowthWheel or add GrowthWheel modules to an existing course. Today GrowthWheel is used for both training programs and one-to-one consulting by more than 2.500 business advisors, incubator managers, angel investors, and entrepreneurship educators in more than 48 US states and in 35 countries around the world. communication and PR. Living the values that shape the branding of the company. With the 360° Screening Tool which finds barriers and opportunities for growth. Because all the Focus Areas in the GrowthWheel Framework are well-known to any entrepreneurship instructor the 360° Screening can be made by either as an introduction to a lecture, or by the students as a way to present the case companies they are working on. The 360° Screening can be done at the GrowthWheel Online platform where instructor and students can share comments and produce reports. But the 360° Screening Tools is also available on paper so it can be used like a napkin to sketch notes as the conversation is taking place. A 360° Screening with GrowthWheel is not based on with 100 questions that gives you a score of 3,2 or 4.8. It’s an intuitive process where the entrepreneurs and their teams indicates the progress or importance of an area with a simple scale: 25%, 50%, 75% or 100%. Based on the screening the discussion can then start. The 360° Screening can help focus on the right topics in three different ways, which support the way an entrepreneur is thinking. You can make a screening to assess progress in different areas, a screening to map opportunities, or a screening to rate personal skills. No matter how the screening is done it will work as a starting point for a discussion about the business or the business idea. A discussion which will end with a conclusion on where to first make decisions and take action to move the business forward. Students can invite team members to the business case - or cases - they work on and use GrowthWheel Online as a collaboration platform to share ideas and make decisions. The output of everything the students works on can be printed as PDF-files for review by peers or as assignments to be handed in. The process with GrowthWheel is focused on making decisions about various aspects of the business and define the action steps needed for execution. GrowthWheel Online allows students to produce 30-60-90 Day Action Plans where team members can add items and prioritize. 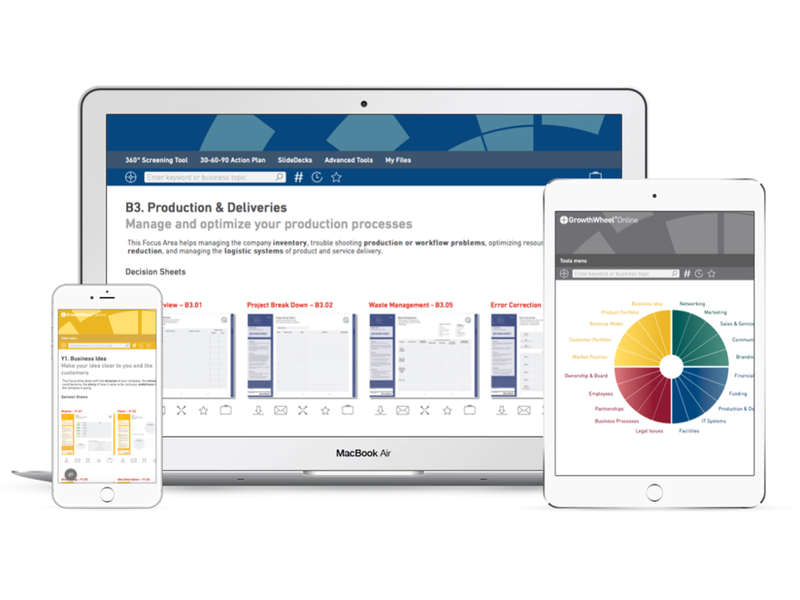 On GrowthWheel Online students can instantly see visual data on the progress of decisions and actions they are working on as well as the outcomes they achieve in their project. Instructors can monitor student progress and see aggregated data for the entire class, which can be used for discussion and evaluation. Pricing for GrowthWheel Certification and License. The Full GrowthWheel License per educator includes unlimited sharing of all GrowthWheel tools. The GrowthWheel Educator License per student includes access to a limited number of modules from the GrowthWheel Toolbox. Group rates apply for groups over 5. Includes life-time free and optional recertification. Includes GrowthWheel Toolbox with 100+ Decision Sheets, Frameworks Booklet, 360° Screening Pad and 30-60-90 Plan Pad. Use and share with unlimited amount of students in several classes. With 40 students the fee breaks down to $100 per student per year. Number and type of modules selected by the educator. The fee per student can be collected by the educator or GrowthWheel can produce access cards for purchase in the book store. Online access to GrowthWheel Online for all student. The right to charge students a higher amount for the toolbox and access to GrowthWheel Online (for purpose of program income). 4 annual updates of content. 10 annual updates of software. GrowthWheel is a proud sponsor of NACCE - National Association for Community College Entrepreneurship. GrowthWheel is a proud sponsor of USASBE - United States Association for Small Business and Entrepreneurship. GrowthWheel is a proud sponsor of GCEC - Global Consortium of Entrepreneurship Centers.